Taylor and Wesley booked a cruise ship tour along the Caribbean for their first-year anniversary. 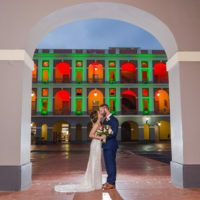 After a few days of sailing, they stopped at Old San Juan, where I met them, champagne bottle in hand, for their anniversary vacation photos. I showed them around town, taking scenic vacation portraits for them. It was quite a calm morning, but really hot, so at one point we stopped at a coffee shop for air conditioning and changing to lighter clothes. We finished the morning at the beach, with its soft lighting and beautiful weather, we ended up with very relaxed portraits. Day-drinking approved. Cheers to the happy couple!